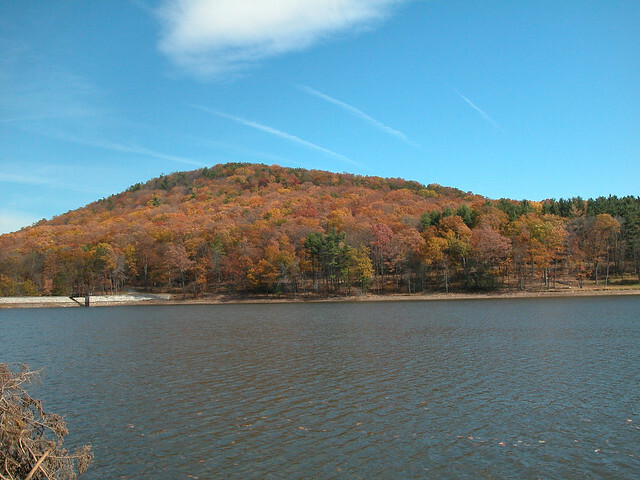 Cowans Gap State Park is a 1,085-acre park in the beautiful Allens Valley of Fulton County. A 42-acre lake, large campground, rustic cabins, and many hiking trails are prime attractions. Buchanan State Forest surrounds the park, providing additional options for recreation and natural beauty in all seasons. The park is north of US 30 between Chambersburg and McConnellsburg. From the west: I-76 to Exit 180, Fort Littleton, then US 522 north to Burnt Cabins and follow signs to the park. From the east: I-76 to Exit 189, Willow Hill, then PA 75 south to Richmond Furnace and follow signs to the park. From the south: US 30 to PA 75 north at Fort Loudon to Richmond Furnace and follow signs to the park. The concession in the day use area serves many snacks and hot foods. It also has ice, charcoal, and other camp supplies. The concession is open Memorial Day weekend to Labor Day. Programs are offered April to November. Contact the park office for more detailed information. Restrooms in these areas are designated with the symbol for accessibility. A special vehicle permit is issued at the park office to give access to areas of the park not open to vehicles.